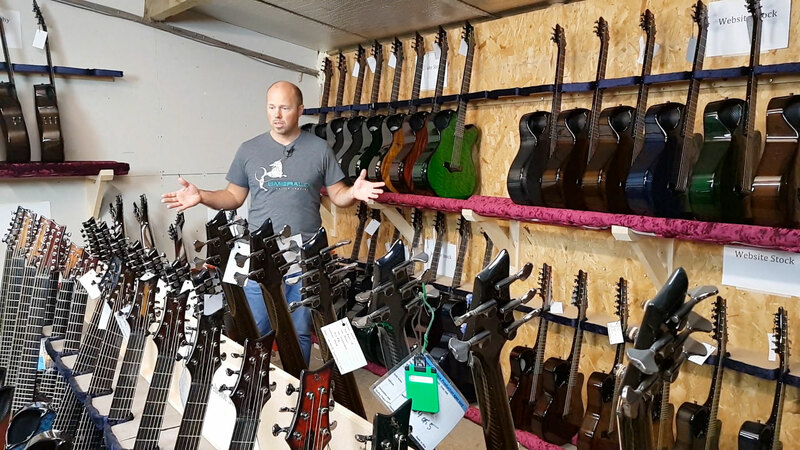 Alistair brings you up to the Emerald Guitars stock room for a tour of the wide variety of instruments currently in stock and available for immediate shipping. Browse the selection of available guitars in the videos below, organized by model. To learn more about Emerald’s current stock, visit our current stock page. If you have any questions about a certain guitar, feel free to drop us a line at sales@emeraldguitars.com. We’d love to hear from you! The guitar reimagined with the player in mind, not tradition. The X20 is our most popular guitar, and for good reason: great playability, a big voice, and stunning design. The X20 features sculpted asymmetrical bevels and a carefully contoured back for ultimate comfort and accessibility. The X20’s unique soundhole gives powerful full-spectrum projection to the player as well as to the audience for a pristine sound experience. We’ve used everything that carbon fibre allows us to do to create a guitar that looks and feels as unique as it is. The X20 is also available as a left-handed guitar. Learn more about our current stock of X20 guitars. Emerald’s innovative design and construction methods allow you to bypass the traditional tuning, playability, and structural problems of 12-string guitars entirely. The unique one-piece carbon fibre design of the X20-12 allows for a light yet incredibly stable 12-string guitar, with a voice as big as an orchestra. Learn more about our current stock of X20 12-string guitars. Known as the mandolin for guitar players, the Amicus is designed with a short 18” scale, tuned up to D — the same as having a capo on the 10th fret, providing the high brilliance of a mandolin sound but with a tuning that’s familiar to a guitar player. Expanding the sonic possibilities, the Amicus will add compelling textures, depth, and rich dynamic range to any musical situation. A great addition to any guitar player’s collection. Learn more about our current stock of Amicus guitars. Compact size, full-size sound. Whether you are looking for a compact guitar for playing at home or on stage, or are looking to bring your best sound with you on the road, the X7 is an excellent choice. The X7 features smooth bevels and asymmetrical side design for ultimate comfort. 24” scale and a deep rear cutaway offer full ease and playability right to the 20th fret making the X7 the easiest-playing acoustic yet. The innovative one-piece carbon fibre design and unique soundhole position allows for a light and responsive top, providing the warmest, fullest tone you’ll ever find in a parlour-size guitar. 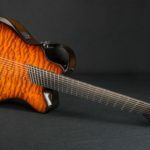 Learn more about our current stock of X7 guitars. Magical resonance. Infinite possibilities. Emeralds’s Synergy harp guitars give you a lifetime’s worth of inspiration. Deep, sustaining bass tones perfectly complement the warm, articulate midrange and shimmering highs in a beautifully balanced instrument that comes alive with subtle sympathetic resonances at every touch. Masterful ergonomic sculpting creates an instrument so balanced and comfortable it almost disappears when you hold it, leaving only you and the music. Learn more about our current stock of Synergy harp guitars. Endless possibilities. Built for exploration. Made using our unique one-piece moulding technology, the Chimaera is incredibly strong and stable with absolutely no joints to fail. This strength allows the instrument to be lighter in construction with a top that is delicate and responsive, yet stiff enough to resist the pull of all 18 strings. A unique instrument with a unique voice, this 18-string beast is ready to lead you into new creative territory. Learn more about our current stock of Chimaera double-neck guitars. The X30 changes everything you thought you knew about jumbo guitars — great ergonomics, balanced tone, and high fret access. If you want a big sound, you need a big guitar. The X30 has the big sound you expect from a jumbo guitar, but the innovative ergonomic design features allow for the X30 to be the most comfortable jumbo guitar you will ever play. Learn more about our current stock of X30 guitars. Raising the standard of acoustic basses, the Balor is one of the most acoustically powerful, lightweight, and comfortable basses ever made. Extensive ergonomic contouring allows the Balor to feel like an instrument half its size. With an arm bevel, rib bevel, angled side and a heel-less neck design that gives effortless access to the 24th fret, you may never put it down. Learn more about our current stock of Balor basses, including Emerald’s 5000th guitar!